I already miss my little Salvation Army store in downtown Conway. It was the perfect shopping solution for a grad student strapped for money...I would bring home 3 bags full of home decor stuff to tweak a little and be out merely a $10 bill. I went every couple of weeks and always found things I knew I could do something with, even if I didn't know what that something was when I bought it. 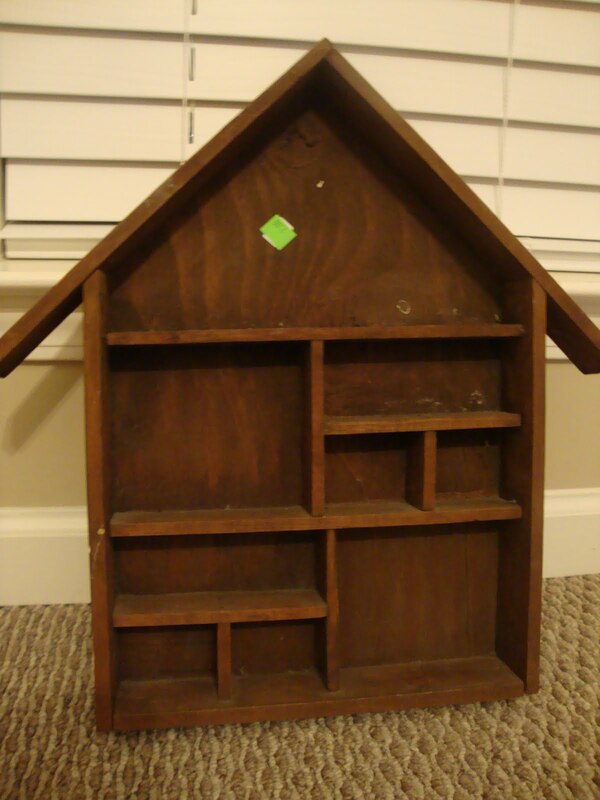 That's how I felt about this little house-shaped knick-knack shelf when I bought it for $2.00 over 6 months ago. I immediately knew I wanted it to be a little replica of our future house, but wasn't sure how I would use it...I just knew it was mine. 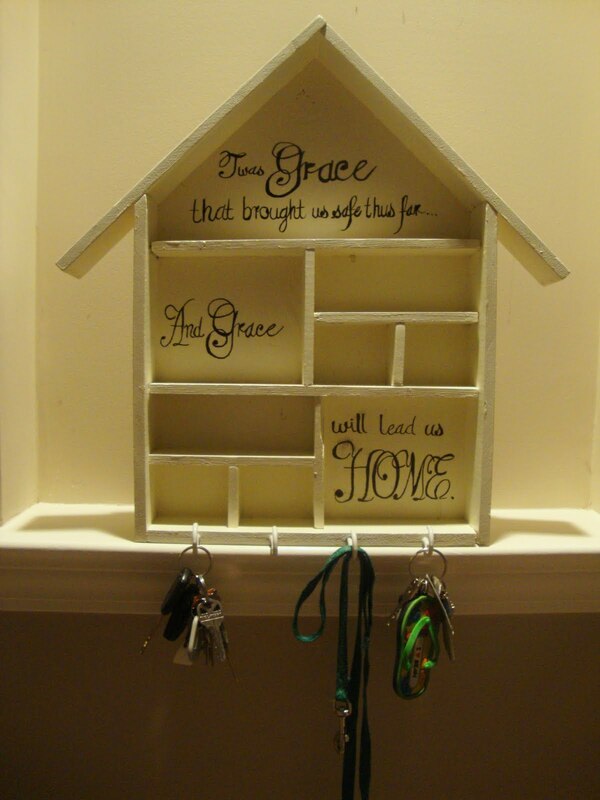 I knew it would be the perfect script to write on the shelf, which will be a key rack placed in the entry of our house. Since it's not all about me :) I changed the "me" to "us". And since we're not in our house yet, it is yet to be hung, but...here it is! I free-handed the script with a calligraphy sharpie and bought a pack of 4 white cup hooks for $0.97 that just screwed into the wood with a pre-drilled or nailed hole. We can put little knickknacks in the cubbies when we first come in the door or just small pieces to display. 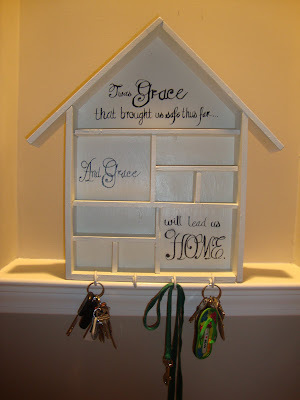 It has to be one of my favorite projects I've ever done and it will be one of the first items hung in our new home. I hope you like it! 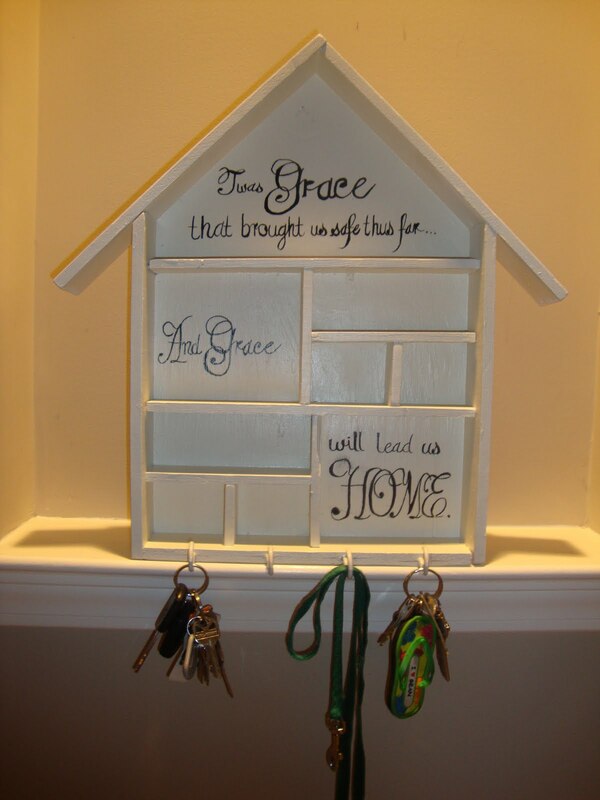 *Here's the key rack, now hanging in our home as a reminder of how far we've come and how blessed we are to be here. In addition to obviously keeping our keys in check, the compartments are a lifesaver spot for sunglasses, jump drives, ear-buds, and anything else we need to grab on the go.